The 69th Primetime Emmy Awards honored the best in U.S. prime time television programming from June 1, 2016 until May 31, 2017, as chosen by the Academy of Television Arts & Sciences. The ceremony was held on Sunday, September 17, 2017 at the Microsoft Theater in Downtown Los Angeles, California, and was broadcast in the U.S. by CBS. The ceremony was hosted by Stephen Colbert. 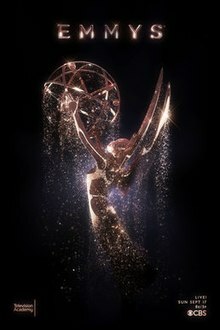 The 69th Primetime Creative Arts Emmy Awards were held on September 9 and 10, and was broadcast by FXX on September 16. The nominations were announced by Anna Chlumsky and Shemar Moore on July 13, 2017. Channelwise, the freshman HBO science fiction western drama Westworld and NBC sketch comedy Saturday Night Live were the most nominated programs, each with 22 nominations. Host Stephen Colbert opened the ceremony with a song-and-dance number and a monologue that lampooned the state of the world under President Donald Trump, which The New York Times said set an anti-Trump tone for the rest of the event. Many of the further presentations and host commentary continued jokes aimed towards Trump, along with winners' speeches criticizing the President and standing behind diversity in the television field. Sean Spicer, Trump's former White House Press Secretary, made an appearance in which he parodied himself. RuPaul played a living Emmy statue in a comedic interview segment with Colbert during the ceremony. Original programming web television services—Netflix and Hulu—upended traditional broadcast television series in several categories. Netflix series earned a total of 20 Primetime Emmy Awards, following only HBO with 29 and leading NBC with 15. Hulu's The Handmaid's Tale became the first web series to win Outstanding Drama Series. Additionally, web television also won their first awards for Outstanding Lead Actress in a Drama Series (Elisabeth Moss for The Handmaid's Tale – Hulu), Outstanding Guest Actress in a Drama Series (Alexis Bledel for The Handmaid's Tale – Hulu),[note 1] Outstanding Writing for a Drama Series (Bruce Miller for The Handmaid's Tale – Hulu), Outstanding Television Movie (Black Mirror: San Junipero – Netflix), and Outstanding Writing for a Limited Series, Movie, or Dramatic Special (Charlie Brooker for Black Mirror: San Junipero – Netflix). 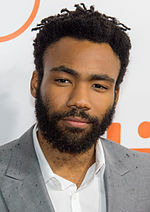 In addition, the night saw several other historic firsts: Donald Glover became the first African-American to win Outstanding Directing for a Comedy Series for Atlanta. Riz Ahmed, with his win for Outstanding Lead Actor in a Limited Series or Movie for The Night Of, became the first Asian to win that category as well as the first South Asian male to win an acting award and first South Asian to win a lead acting award. Moreover, Ahmed and Dave Chappelle also became the first Muslims to win acting awards, with Ahmed being the first Muslim to win a lead acting award and Chappelle the first to win for a guest role for Saturday Night Live. With Aziz Ansari and Lena Waithe winning Outstanding Writing for a Comedy Series for Master of None, Waithe became the first African-American female to win that award. Finally, Julia Louis-Dreyfus won her record sixth consecutive award for Outstanding Lead Actress in a Comedy Series for the same category for the same role in a single series as Selina Meyer on Veep; she is now tied with Cloris Leachman for the most wins as a performer. The awards ceremony drew 11.4 million viewers, on par with the previous awards ceremony, but one of the lowest viewerships for the Primetime Emmy Awards overall. Analysts attribute this to younger audiences preferring to watch clips or summaries than the entire event and to Florida markets being affected by Hurricane Irma. Matthew Rhys "Everything is Better on TV"
Broadway actor Christopher Jackson performed Stevie Wonder's "As" as images of television personalities who died in the past year were shown in the following order. ^ a b c d Koblin, John (January 23, 2017). "Stephen Colbert Will Host the Emmy Awards". The New York Times. Retrieved January 23, 2017. ^ "Stephen Colbert to Host the 69th Emmy Awards" (Press release). Academy of Television Arts & Sciences. January 23, 2017. Retrieved January 23, 2017. ^ "Emmy nominations 2017: the full list". Vox. July 13, 2017. Retrieved July 13, 2017. ^ "Anna Chlumsky and Shemar Moore to Announce Emmy Nominations" (Press release). Academy of Television Arts & Sciences. June 29, 2017. Retrieved June 29, 2017. ^ Otterson, Joe (July 13, 2017). "Westworld: Inside HBO Drama's Long Journey to 22 Emmy Nominations". Variety. Retrieved July 13, 2017. ^ a b "The Best and Worst Moments of the 2017 Emmys". The New York Times. September 18, 2017. Retrieved September 18, 2017. ^ Holloway, Daniel (September 18, 2017). "Emmys: Diversity Reigns Over Trump as Big Little Lies, Handmaid's Tale, SNL Dominate". Variety. Retrieved September 18, 2017. ^ Shanley, Patrick (September 17, 2017). "RuPaul Plays a Living Emmy Statue In Colbert Sketch". The Hollywood Reporter. Retrieved September 19, 2017. ^ Lawrence, Derek (September 18, 2017). "RuPaul Plays 'Emmy' in Exclusive Interview with Stephen Colbert". Entertainment Weekly. Retrieved September 19, 2017. ^ "Hulu's big Emmy night marks a streaming milestone". CNBC. Reuters. September 18, 2017. Retrieved September 18, 2017. ^ Bishop, Byran (September 18, 2017). "Hulu's Emmy wins mark its emergence as a major entertainment player". The Verge. Retrieved September 19, 2017. ^ Stanhope, Kate. "The Handmaid's Tale Wins Big for Hulu at Emmys". The Hollywood Reporter. Retrieved September 18, 2017. ^ "Donald Glover Is First Black Director To Win An Emmy In Comedy". HuffPost. Retrieved September 18, 2017. ^ Vincent, Alice (September 18, 2017). "Riz Ahmed makes history as the first Muslim man to win an acting Emmy". The Daily Telegraph. ^ "Riz Ahmed makes history as the first South Asian man to win an Emmy acting award". The Washington Post. Retrieved September 18, 2017. ^ "Riz Ahmed Is The First Muslim & South-Asian Emmy-Winning Actor Ever". Bustle. September 18, 2017. Retrieved September 20, 2017. ^ "Lena Waithe Makes Emmy History as First Black Woman to Win for Comedy Writing". Variety. Retrieved September 18, 2017. ^ "Julia Louis-Dreyfus Makes Emmy History With Sixth Veep Lead Actress Win". Deadline Hollywood. Retrieved September 18, 2017. ^ Battaglio, Stephen (September 18, 2017). "Emmy Awards draw 11.4 million viewers to CBS telecast, even with last year". Los Angeles Times. Retrieved September 18, 2017. ^ Gunderman, Dan (September 18, 2017). "Emmys get worst all-time ratings in hurricane-affected markets". Daily News. Retrieved September 20, 2017. ^ "Emmys winners 2017: the full list" (PDF). The Guardian. September 17, 2017. Retrieved September 18, 2017. 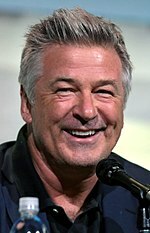 ^ "Emmys 2017 Winners List". The New York Times. September 17, 2017. Retrieved September 18, 2017. ^ Rodriguez, Karla (September 7, 2017). "Emmys 2017: Oprah Winfrey, Reese Witherspoon, Anna Faris and More Stars Set to Present". Us Weekly. Retrieved September 9, 2017. 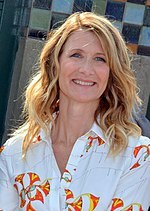 ^ "First Presenters Announced for 69th Emmy Awards" (Press release). Academy of Television Arts & Sciences. September 6, 2017. Retrieved September 9, 2017. ^ "More Top Talent to Present at the Emmy Awards" (Press release). Academy of Television Arts & Sciences. September 13, 2017. Retrieved September 13, 2017. ^ Beachum, Chris (September 13, 2017). "Emmys 2017: In Memoriam to honor Mary Tyler Moore, Jerry Lewis, Don Rickles and at least 50 more TV legends". Gold Derby.